Snæfellsbær is a municipality locatit in wastren Iceland. As o 1 Januar 2011, it haed a tot population o 1,723. The tot aurie is 684 km². 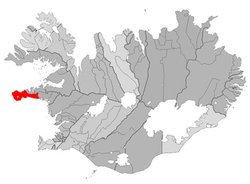 Its admeenistrative centre is Ólafsvík an the majority o the residents live in Ólafsvík, Rif an Hellissandur. This Iceland-related airticle is a stub. Ye can help Wikipaedia bi expandin it. This page wis last eeditit on 11 Mairch 2018, at 04:45.